GIS Cartography: A Guide to Effective Map Design. CRC Press, distributed digitally by VitalSource Technologies, Patent Pending. 2014. 317 p. $99.95. In reviewing this title, I had both the digital version and the print version of the book. The digital version of “GIS Cartography” book was downloaded after one unsuccessful attempt: you need to register an account and also to have specific software (I used here VitalSource Bookshelf version 6.2.3) installed, and various security clearances through the publisher interface. Moreover, the reader can access the book only if his device is connected to the technical software that enables the access and reading of the book. However, I did find very useful the capability to increase and decrease the text font size, to make notes as you read, and to highlight paragraphs that you want to share or clarify with others (provided that these people can share the book). I also found extremely useful the author’s website http://gretchenpeterson.com, which everybody should reference. As a geospatial practitioner, I found “GIS Cartography” to be a treasure trove for any mapmaker: both with the basic mapping design principles in Chapters 1 to 8 and when it discusses the digital dynamic mapping in Chapter 9, mainly focusing on the “zooming” aspect related to the visualization of geospatial data in digital dynamic maps. This book presents best practices for both printed and digital dynamic map designs. 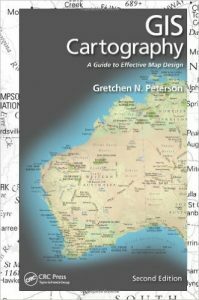 The book’s Introduction chapter deals with making cartography as accessible as possible. The concept that “creativity can be learned” by everyone “doing and seeing” is extremely important and needs to be repeatedly stressed, and helps the self-confidence of any mapmaker. Similarly, Chapter 2 titled “Creative Inspiration” follows from the Introduction because it stresses that everyone can become a mapmaker and gives tips and tricks to use by a novice mapmaker as well as an expert. These two chapters are thought-provoking and should be read by anyone involved in the STEAM (Science Technology Engineering Arts and Math) activities, for example. Chapters 3 and 4, titled “Layout Design” and “Fonts” respectively, describe the basic rules of the different elements that constitute a map. Even for geospatial experts, these chapters are useful to read, and several concepts are reinforced, as throughout the book, by examples. In addition, if somebody needs some help in better communicating a concept, these chapters are designed for you. Chapter 5, titled “Color”, deals with a major issue in map visualization. I believe that this chapter is particularly useful as a review of the basics of color theory. In addition, I found very beneficial the numerous examples included, the discussion about how to construct maps for color blind people, as well as the appendix of Color Swatches with a quickly reference of the Red, Green, and Blue values for some geospatial features. Chapter 6 discusses the display and visualization of different elements, such as hydrographic features (rivers, streams, bodies of water), cities and towns, political boundaries, elevation and hillshade, parcels, currents, and winds, other weather features, temperature, land use and land cover, trails, and utilities. In addition, the chapter includes a discussion, although somewhat too short, on Field Mapping, another discussion on impervious surfaces, basins, and buildings, and an extremely useful analysis of how to display soils and geology. In the printed book, I did not find a discussion on vegetation and animals, and I would recommend its inclusion in the next edition of the book. Chapter 7 covers static maps. It provides useful information about publishing images on paper and on digital devices, about the best image format to use and about dpi (dots-per-inch ratio). The dpi issue is connected to the spatial resolution of an image, although the discussion does not clarify the different requirements in making an image of publishable quality for a print, slide, poster or report document or for a web-based, digital interactive map. In the chapter, I liked particularly the recommendations about how to make a better slide presentation, reports, and posters. However, there strangely was no information on typical formats such as kmz/kml and hdf that are very popular in the geospatial industry. In general, I believe that this chapter would have benefited if it had been expanded. Chapter 8 introduces reader to projections. I liked this chapter because the author assumed that the reader knows basically nothing about coordinates and projections. The chapter walks a reader through choosing a common projection in the real world, and it provides the reader with additional resources on the topic of projections, as many books have been written on the subject. In terms of content, I would add in the next edition the case identifying the coordinates and projections reported in a map, if a person needs to integrate geospatial data coming from different sources. Chapter 9 titled “Zoom-Level Design” focuses on digital dynamic mapping. I would have titled this chapter “Dynamic Maps” or something similar, as this chapter is a companion to the “Static Maps” chapter. The author explains her decision for calling this chapter zoom-level design because good design principles must be applied to both printed and digital maps. I understand that the author wants to stress some of the requirements needed for digital dynamic maps, such as the development of specific design in relation to the zoom-in spatial resolution, but I think that, while talking about digital dynamic maps, many other parameters might have been discussed. I also would have liked the chapter to include more information about the requirements of electronic interfaces and more insights about selecting the most effective designs for particular situations. Nevertheless, the chapter is filled with useful information, supported by good examples, of which some may be found in the appendixes from “Layout Sketches” to “Map Examples” and “Color Swatches”. 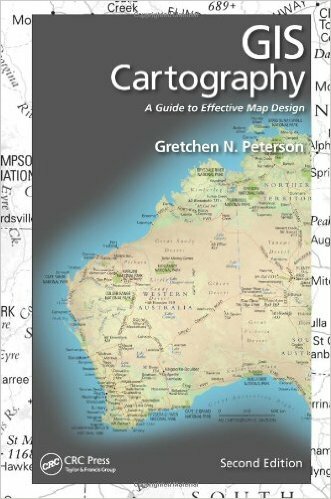 In conclusion, I highly recommend this book, either in printed or digital version, to anyone who wants to design, generate and render maps both in the printed or digital form. As a geospatial practitioner, I like to have the printed copy and a digital copy of the book, for the difference in experience that it gives me: the printed book allows me to scan quickly the Table of Content (TOC) and to figure out fast its main points. However, the digital book is more useful when I already know what to look for and I want to quickly search and read on a particular topic throughout the book, for example to get inspiration for a new design or way to visualize a set of data. I hope that, in the next edition, the author will include chapters dedicated to digital dynamic maps and to longitudinal profiling, which involves visualizing features that change through time. Throughout the book, the author includes useful references about digital dynamic maps and longitudinal profiling, but I believe that these topics need a much deeper discussion. Beyond these minor shortcomings, “GIS Cartography: A Guide to Effective Map Design, Second Edition” is an important contribution to the cartography literature and it is definitely worth to have in your own library.